SB 1062 Arizona Gov. Brewer Vetoes Controversial Bill : The Two-Way The legislation would have allowed business owners to refuse service to gays and others if the customers offended their religious beliefs. Arizona Gov. Jan Brewer says she has vetoed controversial legislation that would have allowed business owners in her state to refuse to serve gays and others if those customers somehow offended the proprietors' religious beliefs. Brewer, a Republican, announced her decision at a news conference held Wednesday afternoon, following a flurry of meetings between the governor and state legislators. "I call them like I see them," Brewer said of the proposal, "despite the cheers or the boos from the crowd." "I have not heard one example in Arizona where a business owner's religious liberty has been violated." "The bill is broadly worded and could result in unintended and negative consequences. After weighing all of the arguments, I have vetoed Senate Bill 1062, moments ago." As our colleagues at KJZZ in Tempe report, Brewer had been pressed by leaders of Arizona's business community and some of her fellow Republican lawmakers to reject the legislation, known as SB 1062 (or Senate Bill 1062). According to KJZZ, Republican strategist Jaime Molera said business leaders believed a veto would help buttress Arizona's reputation nationally — and avoid a repeat of the boycotts that followed enactment in 2010 of the controversial immigration legislation known as SB 1070. "Three Republican state senators have reversed their position on the bill in light of the controversy it's ignited," KJZZ adds. "Sens. Adam Driggs, Steve Pierce and Bob Worsley sent Brewer a letter Monday asking her to veto the bill." "And religious leaders increasingly said they saw no purpose in what supporters call a 'religious-freedom bill.' "
Apple is in the midst of investing hundreds of millions of dollars for a production facility in Arizona. In addition to creating hundreds of jobs, the massive project has also brought new infrastructure projects to the area, as the company seeks sources of renewable energy. Announcing that project last November, Brewer said, "Apple will have an incredibly positive economic impact for Arizona, and its decision to locate here speaks volumes about the friendly, pro-business climate we have been creating these past four years." The Arizona Capitol Times reminds us that the Super Bowl was taken away from Arizona once before, after it revoked Martin Luther King Jr. Day as a state holiday in 1987. As a result, the NFL moved the 1993 Super Bowl to Pasadena, Calif. 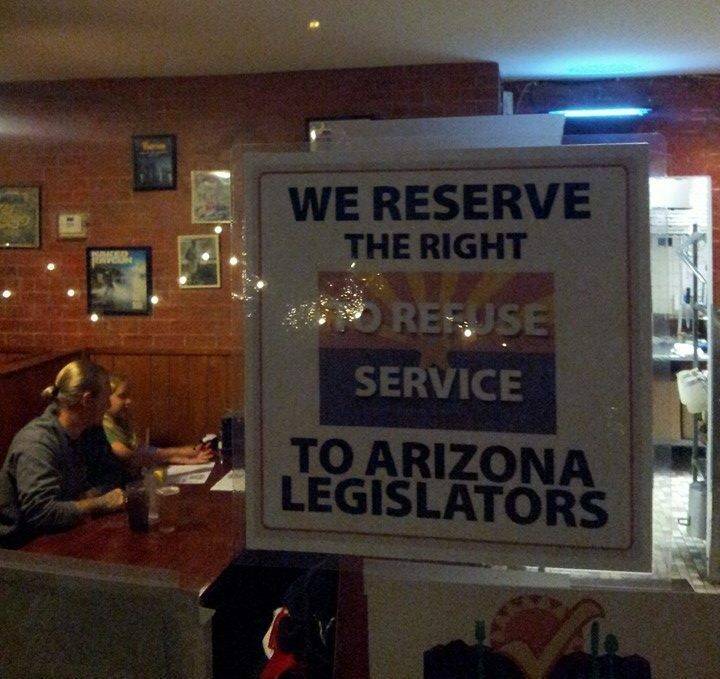 Smaller local businesses also weighed in — including, most famously, Rocco's Little Chicago Pizzeria, which posted a sign warning patrons that the Tucson restaurant reserves the right "to refuse service to Arizona legislators." The Tucson restaurant Rocco's Pizzeria created a stir when it posted a sign in its dining room reacting to a new Arizona bill that would allow businesses to refuse to serve gays and others if they offend proprietors' religious beliefs. As the Phoenix New Times reports, several Phoenix businesses used their Facebook pages to post pictures that included a flier designed by the local group ONE Community that states, "Open for Business to Everyone!" Bloomberg Businessweek notes that "Arizona's bill is similar to measures proposed in Georgia, Idaho, Maine, Mississippi and Kansas in response in large part to the nation's populist gay marriage movement." Critics say that such legislation seeks to codify bigotry. But as NPR's Alan Greenblatt reported Tuesday, experts also say social conservatives are feeling threatened by what they see as a rapidly shifting U.S. culture under President Obama's leadership. "There's genuine fear that religious liberty could be severely restricted," John Green, an expert on religion and politics at the University of Akron, told Alan. "Whether we believe those fears are justified or not is a different question."